North Sails President, Ken Read, doubles as a live commentator for the official TV feed from the America’s Cup World Series. Here are his thoughts, from his blog on the North Sails website on the recently completed round of the Louis Vuitton America’s Cup World Series in Toulon, France. 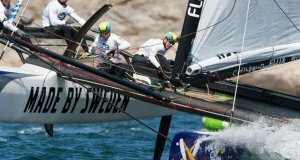 Read also looks ahead to the final round of the America’s Cup World Series is Fukuoka, Japan and the strategies that may be employed. It has been a beautiful weekend here in Toulon. It was as we had all anticipated – a light air regatta – so there were no surprises there, but it is a really interesting fleet when its these sort of conditions. A couple of the players are super competitive in the light air, especially the local heroes on Groupama, so it was set up to be a great regatta. I’m not sure I would have much liked to be taking part, but it turned out to be nail-biting to watch and a really fun event. One of the other things that I was interested in this weekend was – will Oracle Team USA struggle with Jimmy Spithill being out and them having to use a new helmsman in Tom Slingsby? 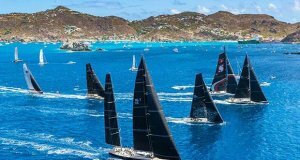 I think we have seen time and again now that no matter how talented the ‘stand in’ helmsmen is in their own right (and we have had a pretty stellar list in Francesco Bruni, Glenn Ashby and now Tom Slingsby), it is not easy. Oracle Team USA certainly scuffled at this event, but it shows that practice really makes perfect. Let’s be honest these guys are superstars in the sport, but they have all found it hard to be catapulted into the helmsmen position, it also gives you an idea of the level of talent that is out there. It is incredible. 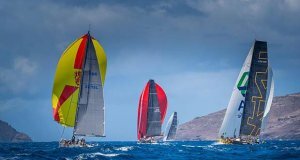 In terms of the racing, it was a ‘streaks’ weekend – the longest streak won the regatta and that was Artemis Racing here. They looked prepared, organised and very calm. The first question I asked Outteridge yesterday when we talked to him post-race, was whether he thought it was a coincidence that the two teams led by helmsmen who had just competed in the Olympics Games in Rio (Outteridge and Burling) were also the two teams who came out of the blocks hardest and best. He did not think it was a coincidence at all. I reckon it shows that racing and testing are two completely different things. Testing in a boat that is actually very different to these boats versus actual racing – hand to hand combat, keeping your mind sharp and making those split second decisions better are just not the same. He felt race ready and super sharp and look where they ended up…. The slight irony is that Artemis have struggled with consistency throughout this series yet it was their performances over the whole weekend that won them this regatta. They have either done really well or really badly but haven’t managed to string together the bits in the middle. The problem with that is you can quickly lose quite a lot of points and see yourself slipping down the leaderboard. On the flip side of that, if in between the wins you can grind out some middle of the fleet finishes you can keep yourself in contention. I think the other teams that did well showed this to be true – Softbank Team Japan had a lousy streak of races on Saturday but a streak of great races today (Sunday) and they are second overall. It feels like we hardly even talked about them that much this weekend but there they are on the podium. The same thing with Land Rover BAR – shocking first day with two last places on Saturday and then you look at the scoreboard, and they came out having extended their overall lead at the end of the regatta. I would say the big surprise of the event was Burling – he came out fast, and they looked great, but I am guessing the team will be disappointed in how it finished. You could make a case that he was still celebrating and his mind wasn’t quite fully back into it, I mean a gold medal would make you a little giddy but they said that wasn’t the case, they said they were mentally ready, and I think they will feel they underperformed in the end. They had a real shot at getting back solidly into the overall standings, but they didn’t really do that. They are fighting for a big two points going into the challenger series and right now with all the scuffling and weirdness of this weekend, Land Rover BAR comes out with a reasonable result and a pretty substantial lead to fight for those two points going into the last, Japanese regatta. You have to forget the battle now and look to the bigger picture – who is second, third, etc. and make sure you don’t do anything silly and keep the guys behind you in check. So maybe the top three will now be looking at the overall standings rather than just on the individual regatta standings. None of them, across the whole fleet, will give up anything, and we have seen how so much can change so quickly, so it is going to be all to play for. I love Japan, and they have a great sailing fan base, and I know lots of people are really excited about the America’s Cup reaching their shores, so I am really looking forward to the final stop on this tour before the countdown to Bermuda.